In my experience testing thousands of apps for kids, one thing I notice is how much kids love music. They love to hear music, dance to the music, and play musical instruments. That’s why apps with excellent music tend to have longer playtime among kids. Today, I want to highlight a unique app that teaches kids to see and feel the beat with the help of dancing monsters. It is called BoomKLAKers, and its developers believe that dancing is a lifelong skill that can be introduced from a young age. Watch how the monsters move uniquely in 13 different beatbox tracks. Boom! KLAK! Boom! Boom! KLAK! BoomKLAKers is inspired by street dance techniques such as popping and locking, martial arts, and acrobatics. Simply by tapping on screen, kids can watch a group of monsters jump, dance, and do back flips. They can also tap the monsters to make them follow this sequence: Boom! KLAK! Boom! Boom! KLAK! In the app, each tap represents a beat. Kids learn to associate dance movements to these beats by watching how the monsters respond to their taps. After kids repeat the dance sequence manually several times, the app will show a full musical animation. BoomKLAKers includes the most unique sounds; it has 13 original tracks by French beatboxer/musician Teddy Guilbaud. Each track is associated with a unique monster, environment, and dance move. The dance moves in BoomKLAKERS were developed by choreographer/dancer Rosa Mei. Rosa and Teddy are members of Cie 13, an experimental dance troupe based in Antwerpen, Belgium. "Moreover, we are parents who want kids everywhere to know and love movement and music, not just as imitators, but as creators, one day to become mad dancing machines or makers of freaky beats... some of the shiniest, happiest people in the world." One of my favorite tracks in BoomKLAKers is the one with the spiders dancing inside the green air tubes. I think BoomKLAKers is a fun app with a great cause. The design works really well for its intended audience: Boom! KLAK! Boom! Boom! KLAK! is a simple beat that younger kids can understand. It helps them get a good grasp on rhythm, which in turn helps build the foundation for understanding music and dance. I like that even though all 13 tracks have the same beat sequence, they have different sounds and ambients. They are also represented by different monsters who live in their own special worlds. In one scene you can see how a three-eyed jellyfish dance inside an aquarium, while in another you may see a group of spiders dancing inside green air tubes. 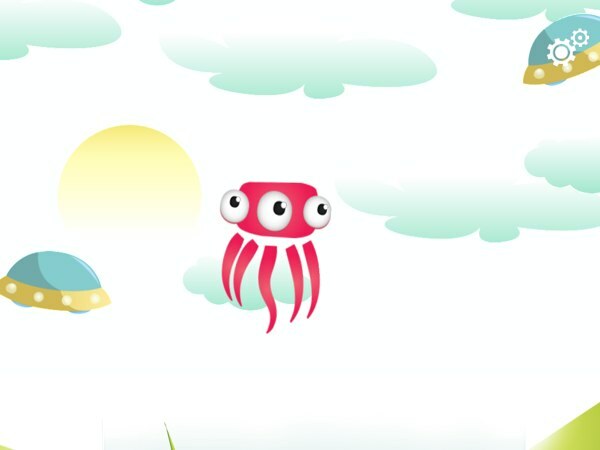 In BoomKLAKers, each monster lives and dances in a different environment setting. BoomKLAKers is a fun musical app for kids ages 1+ to see and learn about rhythm. It shows them how to associate musical beats with dance movements, which is the basic principles for understanding music and dance. It is designed beautifully, and features colorful monsters that dance to 13 original tracks by French beatboxer Teddy Guilbaud. Highly recommended.